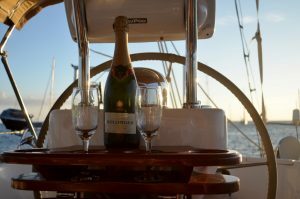 Our trusty blog has been getting as rusty as a yacht that’s been at sea too long so it’s time for a catch up. Looking back, we made landfall in Grenada on 3rd March, nearly two months ago, and we’ve been having rather a lot of fun ever since! The first time we were in the Caribbean on Adina we hurried through. It wasn’t tickling our fancy that much, indeed we were in a rush for adventure to be found much further away. A circumnavigation later we were ready for some good old fashioned relaxing and fun, and the Caribbean provides that in bucket loads. Grenada was all about winding down and enjoying time with friends and family. The Senior Plumes came out for their last overseas visit to Adina and we enjoyed being with them, taking it easy and doing a little bit of exploring. Our friends Donal and Sarah who have settled in Grenada have set up a dinghy and life-raft servicing business and are running away with it. We couldn’t help but admire what they are achieving and be happy for them. And of course Adina’s dinghy and life-raft benefitted from some love and attention in their safe hands. The two of them have got involved in the local community and, amongst other things, Donal helps out with the marina’s weekly quiz night where together with the Senior Plumes and Paul and his crew on Firefly we fancied our chances. The usually kind-hearted Donal showed another side to him and dished out some rather mean questions. We managed a meagre third place for which we received the prize of a bottle of stiff homemade rum punch. Friends Andres and Lucy then flew up from Trinidad for a weekend and we had a ball giving them a little flavour of the sailing life. 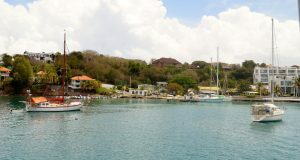 Grenada was of course making it easy for us with lots of sunshine, friendly people and lovely sunsets. Two weeks rolled on by. We bid our farewells, as sad as ever, and started to head north. Our goal was to try to see as much as we could in the limited time remaining in the Caribbean sailing season. We’ve seen a whole heap of gorgeous remote bays and beautiful beaches on our travels so the focus was rather on spots the Caribbean is famous for. We decided we would take tours or hire cars as we deemed relevant; this was our swansong and we were determined to enjoy it. 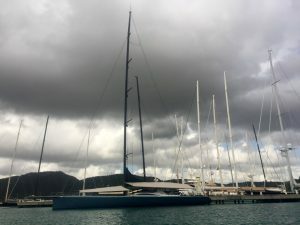 We skipped right on up direct to Martinique to meet up with some of the yachts with whom we had crossed the Indian Ocean, to say more goodbyes. Sailing Mum Sue and Uncle Bill, as we fondly like to call them, from yacht Camomile joined us for a day trip in a rented car and we made the most of it driving all over the place, only returning after dark. Martinique was beautiful and very French – yes, that did mean food treats galore! Our weight was increasing alarmingly fast. In doing some research we’d asked a bunch of cruisers about their favourite Caribbean destination and many listed Dominica, our next stop, as their favourite. It’s not so much a sailing destination but ashore the island abounds with natural beauty, rich in lush vegetation, rivers and waterfalls. This is a place for those who love to hike and explore. We duly signed up for a one day trip and our lazy bodies were subjected to a good dose of exercise. If waterfalls in jungle surroundings are the thing to excite you, Dominica is the place to visit. To add to the effect when we visited it had been raining heavily and the water was flowing fast. One stop involved swimming up-river in a narrow steep-walled rock gorge where the water was so strong you had to push off the wall on one side of the gorge, swimming as hard as you could to get to the other side, only to have to do it again to make any progress – the target a small waterfall. The Adina crew did themselves proud as, whilst our guide failed to make it, we made it to the waterfall! We loved Dominica and we’d certainly go back, there’s plenty more for us to explore there. Off to Guadeloupe we dashed and we were soon appreciating the difference between the French and English islands in the Caribbean. 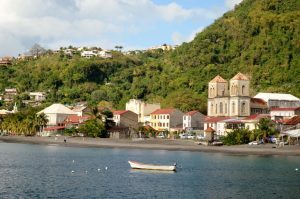 Guadeloupe was typical of what we’ve seen of the French Caribbean islands whereby these are literally French islands in the sun. Take what you may from it – some find them lacking Caribbean flavour, some love them for the good roads, clinics and other facilities in which the French have invested. 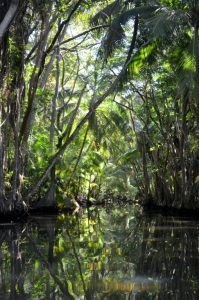 The English islands have been left to the locals – literally, it seems, the English have walked away and left nothing more than a few old sugar plantations and churches slowly going to seed. No investment whatsoever, but on the upside if it’s a bit of genuine Caribbean culture you’re after it’s to be found on these islands. 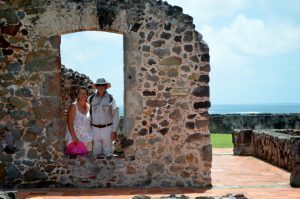 Antigua – whose got the tallest mast of them all? 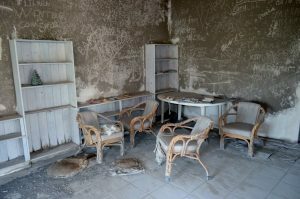 People simply had to up and leave when the volcano in Montserrat covered everything in ash. Feeling somewhat dwarfed, we sailed on to Montserrat and had the unusual experience of seeing a modern town abandoned, covered in ash care of several eruptions from the Soufriere Hills volcanoe which last erupted in 2012. It was here we received the news that we are now members of the Royal Cruising Club (RCC). The RCC is steeped in history and we are delighted to be members. Our thanks to Jane Russell our proposer, Tim and Claire Hagon our seconders and the other members we know who wrote letters of support. Tradition abounds and the RCC burgee must be flown from the masthead whilst the blue royal ensign has to be lowered at sunset and, as we joked, no knickers must be left drying on the guardrails. Sailing away from any risk of volcanic eruptions we pushed on to St. Kitts and Nevis to relax. Well we tried, but there is something about Caribbean folk that come the weekend they love nothing more than a noisy party that can be heard on the next island and goes on well into the early hours of the morning. We hired a car and realised we could drive around Nevis in thirty minutes so got on the car ferry and drove around St. Kitts in just over double the time! 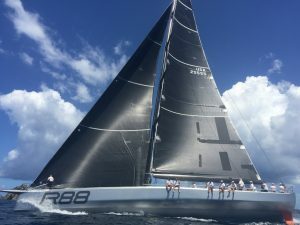 Our friend Susan Glenny was in St. Barts with her race boat and crew for Les Voiles de St. Barth racing regatta. This was too much temptation as in our day we’ve enjoyed the odd bit of fun racing so we dashed over. St. Barts was, as expected, chock-a-block full of yachts and there were no free mooring buoys. Scouting around we found a gap amongst the moorings and anchored. The racing boats were out doing their thing and most had left dinghies attached to the moorings to show they were taken. Sitting and relaxing after anchoring we saw the superyacht fleet appear. Big majestic beasts, slicing through the water with their huge black carbon sails raised. In the lead was the eighty-eight foot Rambler who we recognised; she has held various prestigious records and taken part in races like the Fastnet back in England. Race over, they dropped their sails and motored over to the mooring field. Indeed they picked up a mooring right behind us; if we dragged we’d hit Rambler – not something we really wanted to be reported doing! Then more superyachts came in taking moorings around us. We started to become alarmed as not far to our starboard was a mooring with a dinghy on it which we realised would put one of these giants a little too close to Adina for comfort if they came and moored there. Imagine our relief when a lovely small racing trimaran half the size of Adina sailed onto the mooring and the crew hopped onto the dinghy and went ashore for the evening. 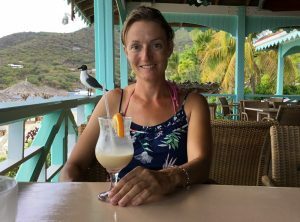 Sue Glenny runs a group called The Sirens who are an all-female team and she is making a well-deserved name for herself racing in the Caribbean and Europe. It was great to see her looking so well and happy and the girls duly included us in their social activities. St. Barts is all French – trendy and very chic and we were loving it. Shortly before leaving to go back to Adina for the night Sue suggested we come out to the start line in the morning. “In our little dinghy with all those fast moving superyachts? Are you barking mad? !” The next morning we found ourselves making our way to the vicinity of the start line in our little dinghy powered by our 8HP outboard engine. How much fun can one have in a dinghy? Several different fleets take part in the racing and with yachts warming up everywhere we stayed well clear and watched, enjoying it all. 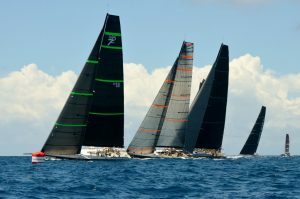 With the ‘smaller’ yachts off, stupidity reigned and we decided to head up next to the start line to watch the superyachts warm-up and start. Our theory was that we could hang out behind the outer mark with the press boats and support vessels that the superyachts have – safety in numbers. The flaw in that theory was that they have engines of 100HP or more and can quickly get out of the way of a superyacht doing warm-ups, charging along the start line at full speed. We’ve certainly had some adrenalin rushes on our trip and this ranked right up there with the best of them. When the likes of Rambler and others are coming straight at you full speed testing the start line, you know in theory from your racing days they will bear away after crossing the line but you are still left praying, ‘Please, please bear away”! The strain the rigging is under on those boats is enormous and the noise made by the strong dyneema lines as the sails are eased is quite something – a big loud groaning echoing over the water. Slightly terrifying, certainly exciting. Needless to say, we were happy when they were finally off and we could trundle back to safety in our humble little dinghy. That night we joined Sue and the girls at a fun party on the beach. We were sad to leave, we’d loved being caught up in all the high octane fun that racing brings. Up to St. Martin and Sint Maarten, two countries, French and Dutch, on one island. As an amusing aside, over the past two years sailing many miles in the Pacific and Indian Oceans Tom has added three new countries to his collection of countries visited. In just one month we had added nine countries to our tallies and Tom now counts over one hundred countries visited with Susie not far behind on just over seventy countries. 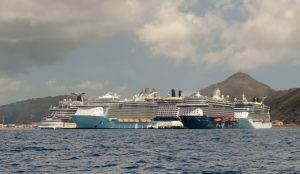 Long story short, we liked St. Martin for its French flavour and were aghast at Sint Maarten with its lines of duty-free shops aimed at the many cruise liners who pull in there. Not that it stopped us adding to our gin collection. You never know who will turn up next and it’s only right to serve them a refreshing drink when in warm climes. 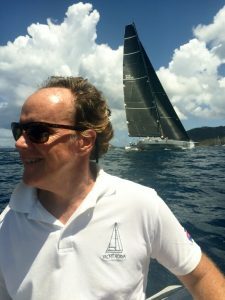 Good friend and Adina Atlantic crew member Gareth Wear had sent an email to say he had flights connecting in St. Maarten that weekend. We’d moved to anchor to spend a day doing boat work but Gareth being one of our great helpers we cancelled the boat work plans, deployed the dinghy in torrential rain, took it to the airport three miles away (still in torrential rain), changed from our sopping wet gear in the toilets in the arrivals hall and then sat and waited. Unfortunately Gareth’s flight was late due to the bad weather. It was really good to see him, albeit briefly, and it just goes to show it’s always worth making a little effort to see those you care about. Time to escape to the British Virgin Islands. These are famed sailing grounds but we admit we were a little apprehensive as this is big charter boat territory and the books warned us we would be fighting for space in the anchorages and seats in restaurants. 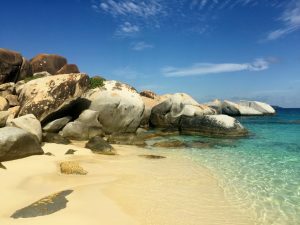 It was crowded and as we arrived in to Virgin Gorda in the north we found ourselves going head-to-head with a chartered catamaran for a mooring buoy. The catamaran was behind us and we lined up to pick up the mooring, approaching from downwind as is normal. Much to our disbelief, the catamaran skipper decided he was going to cut in at full speed from the side to take it! This is in a mooring field already full of boats, dinghies and people swimming. We couldn’t believe it! A quick bit of acceleration, Susie swoops up the mooring in one go, I apply the brakes and bang, job done. 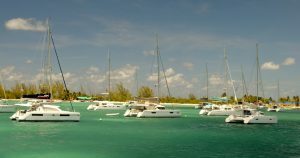 We could then sit back and watch six people on the catamaran’s bow fail to pick up another free mooring they had found. Crowds aside, not to mention the fact that you do need to get up early to get a spot at your next destination and everything is a trifle expensive, we have loved the BVIs. All the islands are just a short hop from each other, there is good sailing, you can still find anchorages where you can be completely alone or you can join in for some partying or good eating with everyone else. We’d got to know some of the World ARC boats and Mike on his lovely big catamaran Paradise Found was in town with Taffy and Pam, who are also great fun, as his crew. 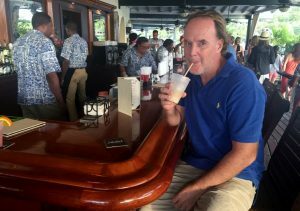 Mike had previously chartered his boat in the BVIs and knew all of the spots – and it was his birthday. A night of fun at Willy T’s on Norman Island and it took two days to recover. Sadly, our adventure is nearly over. This trip was always going to be a career break for us; we’re certainly not retired yet and hopefully have more to offer up in the world. We both love sailing and we both relished the dream of sailing around the world. But we knew the day would come when the trip would be over and we’d have to sell our beloved Adina. She’s wasted sailing in our local Solent waters and is made for bigger adventures. An American branded boat, we’d always expected to end our trip in the Caribbean and sell her in States. Brexit and some research showed us she’s actually better sold in Europe right now and on our sail over to the Caribbean we did the sums and made the decision to ship her home to the UK. It may seem strange to some why we don’t sail her back but our hearts were just not in it. Perhaps if we were to be keeping her we would have but the reality is we now need to move on to the next phase of our lives. And we have been thinking about that a lot and often our minds are already back home in England. A home sadly without Adina but on the positive side we do hope Adina will become a happy home for some new owners who are out there somewhere. We’ve taken her on some magnificent adventures and she has truly looked after us, never flinching; she is without doubt a great sailing boat and we’ve been very proud to be her owners. *”Starboard!” is a term hailed to mean the yacht’s sails are held to port (known as a starboard tack) and the boat has right of way. Racers love to shout it loudly. What a splendid resume’. Thank you both so much and the very best of good fortune to you both in the days and years ahead. I was dining with James Alsop last evening and inevitably you came up in the conversation. Ridiculously I have a tear in my eye and a lump in my throat after reading this blog. I can’t imagine how you must both be feeling about coming home but also finishing the sailing, lots of mixed emotions I’m sure. I’ve loved following your adventures but I’m a tiny bit excited that I might get to see Susie next time I’m over in the UK! Stay safe, enjoy yourself and I look forward to hearing what happens next. Please don’t take your blog down once this trip is finally over. I want to use it as a template for my own circumnavigation.